Fast Broadband Speed What Internet Speeds do I need? What Internet Speeds do I need? Fast Broadband Speed - What Internet Speeds do I need? What can I achieve with my current Internet speed? What can I achieve with real NBN Internet speed? What changes could make business more efficient? What changes could make business more profitable? How can people work smarter using technology? 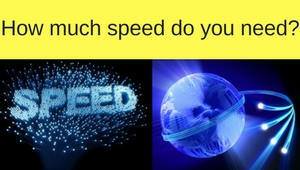 How to get faster NBN Internet Speed? The above table describes a single NBN service. Each service is provided from a gigabit Ethernet socket. This can be expanded to 4 services using the same NBN equipment. Each service can be from different provider. The goal of NBN Co is to provision 12 fibres per 4 blocks of land/premises/houses. Each fibre can provide 4 services each. Therefore 12 fibres can provide for 48 independant users. This will allow for changes in building such as newly built units etc. For large buildings the telephony and Internet use can be managed as a whole. Within the building private fibre and Ethernet networking can be used. Each user can have their own phone and Internet usage bill. Use the NBN to your advantage.